Made for Wizard Jam 7! You are a RESPECTABLE CHEF, make TOAST the usual way. 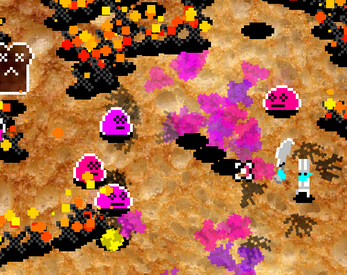 Chop JELLY MONSTERS into FIRE to put out FIRE. Chop BREADMAN into FIRE to make TOASTMAN. JELLY the TOASTMAN to get MEGAPOINTS. Thanks! Fire tends to spawn around where your Chef is to encourage moving around. Since your multiplier gets reset when you're hit I find the best strategy is to play hyper defensively and keep your eye on your Chef at all times. Glad you enjoyed it! Had much fun making toast until a toast bully showed up and ruined my Cheffing. Yoooo thanks so much for playing! !